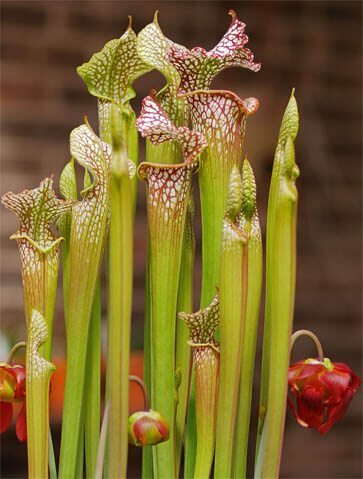 Sarracenia are commonly known as Pitcher Plants or Trumpet Pitchers and can be long-lived and easy houseplants to grow and keep looking attractive from one year to the next. Or they can be challenging and short lived. The difference between the two outcomes is whether you follow the basic fundamental rules (see care instructions further into the guide). If you do, then things will go really well. If you don't, things will go really bad. Although the Pitcher Plant is more forgiving of poor treatment than their fellow Venus Flytrap cousin, they'll still die quickly and easily if you fail to give them what they need for any length of time on a frequent basis. you can certainly have a thriving Pitcher Plant indoors. We won't lie and say they're simple houseplants to have around, but with some small adjustments to how you might treat and care for a "normal" indoor plant, you can certainly have a thriving Pitcher Plant indoors without too much hassle. So why do they make good houseplants? There is no denying they're quite niche plants and don't appeal to everyone, they have a very carnivorous and "alive" look about them, with many varieties having blood red vein markings on the pitchers. Insects, attracted by the colorful pitchers and nectar around the lip, will fall into the large hollow pitcher tubes and find it impossible to climb back out due to fine downward pointing hairs. Eventually, the insects will succumb and are then slowly digested by the plant to provide nutrients for further growth. If you want to learn more about the biology and science this is a great article. Some will think them gruesome, others fascinating or even beautiful. Either way, they're highly interesting and make for unusual looking houseplants. So they've become popular simply because they're very different from the norm which creates huge interest and cultivates a passion for them. When it comes to price and availability they're not cheap to buy or easy to find by any means but equally, they're not at the top end of the houseplant price spectrum or only purchasable from specialists. A good looking Pitcher Plant should probably be around the price of an orchid. 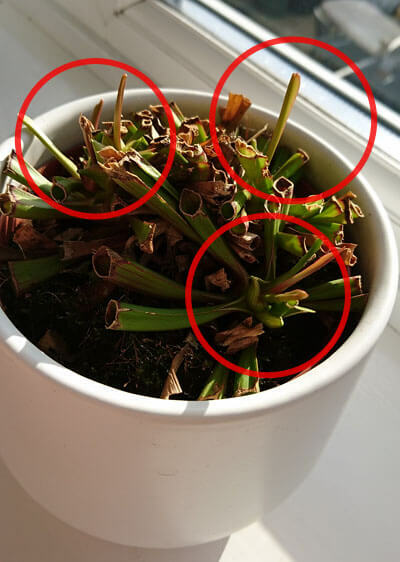 Sarracenia species are also starting to become much more common in the usual places you buy houseplants such as garden centres or even department stores. You'll usually find a compact hybrid of Sarracenia purpurea, which tends to be one of the easiest Pitcher Plants to grow. 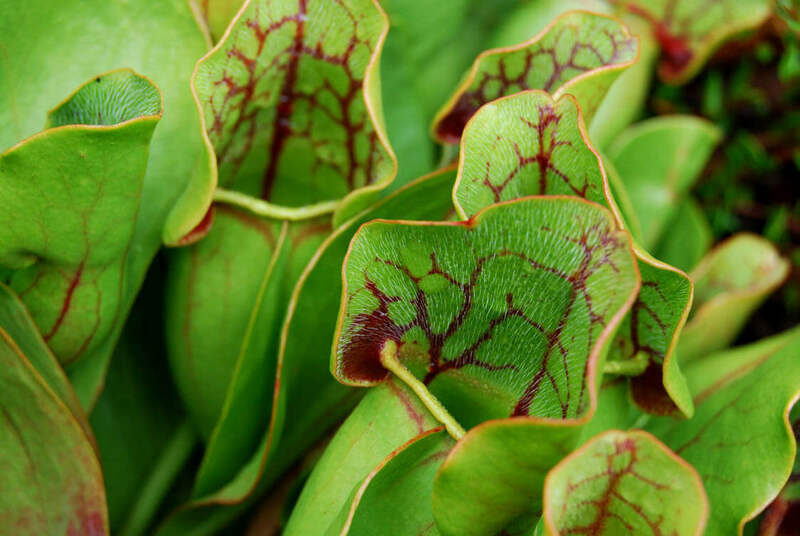 Expect to find plants that look like the picture at the start of this article: lime green pitchers at the base rising towards the top the colours change to a shade between red and purple, some have veins or others might be lightly speckled instead. Do take care if purchasing from a garden centre or department stores because the care being provided while waiting to be sold might not be quite right. Poorly treated plants will quickly start to look unattractive and could be priced up with huge discounts. 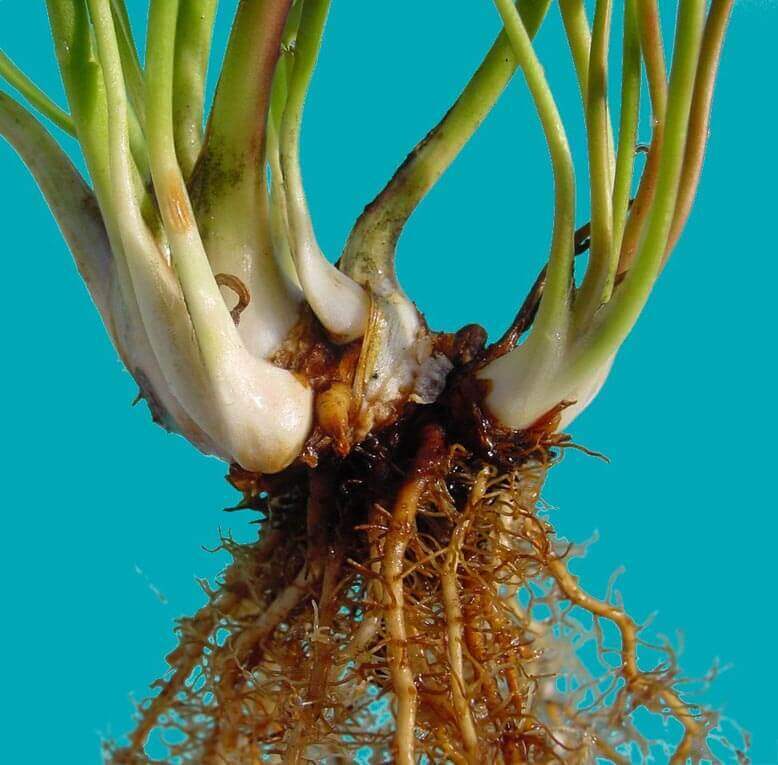 It's the rhizome which sits just below and also above the soil that's important. A tatty looking plant can still come good if given the correct care and the rhizome is still reasonably healthy when you rescue it. 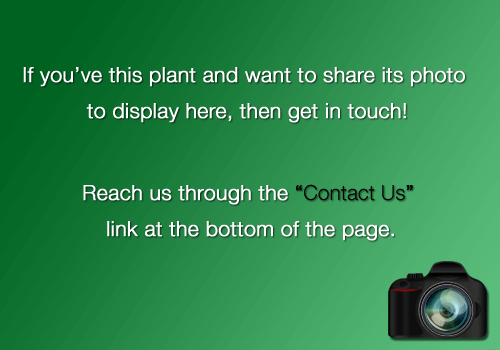 If you're serious about these plants then the specialists are the way to go. They'll label and name the variety clearly and will have grown them exceptionally well with expert knowledge and skill. It's easy to get the bug (pun intended) for these plants and so if you want to expand your collection with other varieties and hybrids then you'll eventually need to look for specialists selling or shipping to your area. If you do explore this route, then the colours and varieties on offer are huge. This is a sun-loving plant and it just can't get enough of it. During the growing season (April to October), your Pitcher Plant must get full sun, or at the bare minimum very bright light, for the pitchers to form and properly develop. South facing windows with full exposure would be this plants first and prime choice. East and West may be suitable as a last resort, but it will need direct sun for at least a few hours a day. 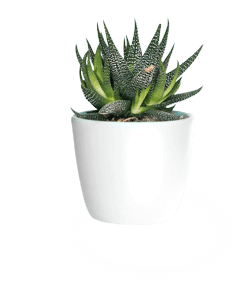 You may just scrape by with a bright location on a windowsill, but in almost all cases you'll need somewhere with direct sunlight exposure for a thriving plant. If you only have space in a North facing room then a long term relationship with this plant isn't going to work out and you should look for something else to go in that room. Keep it permanently wet - This plant needs to be wet or at the very least moist almost all year round. Do not let it dry out at all. The only exception is during the resting period in the cold months of the year at which point you need to reduce watering to prevent the rhizome rotting. You can water very heavily, so the bottom third, or even half of the pot stands in the excess water. The native home for these plants are bogs or marshes which are constantly damp and wet. Sarracenia tend to have a thirst and this combined with the hopefully sunny spot (see above) you're trying to grow it in will mean regular watering is a must. Use the right type of water - carnivorous plants need acidic water and using neutral or alkaline water for long periods will kill your plant. Once or twice in an emergency will be okay because it's better to use the incorrect water than no water at all. The most commonly accessible source of acidic water is rainwater. You may be able to use tap water but only if you live in a very soft water area, hard water must be avoided as it contains too many minerals. Bottled water might be okay, but if it's been collected from springs which run through limestone the water will be slightly alkaline and so this is a no-no. Mineral water shouldn't be used or water from fish tanks or ponds due to the high concentration of nitrates. If you water correctly there should, in theory, be a constant source of moisture around the plant which gives a natural buff to the surrounding humidity levels. This means there is nothing additional you need do here unless you have a very dry home or place your plant in excessively dry air such as above a radiator. In this instance artificially raising the humidity level will be needed to prevent the tips of the pitchers from becoming crispy. 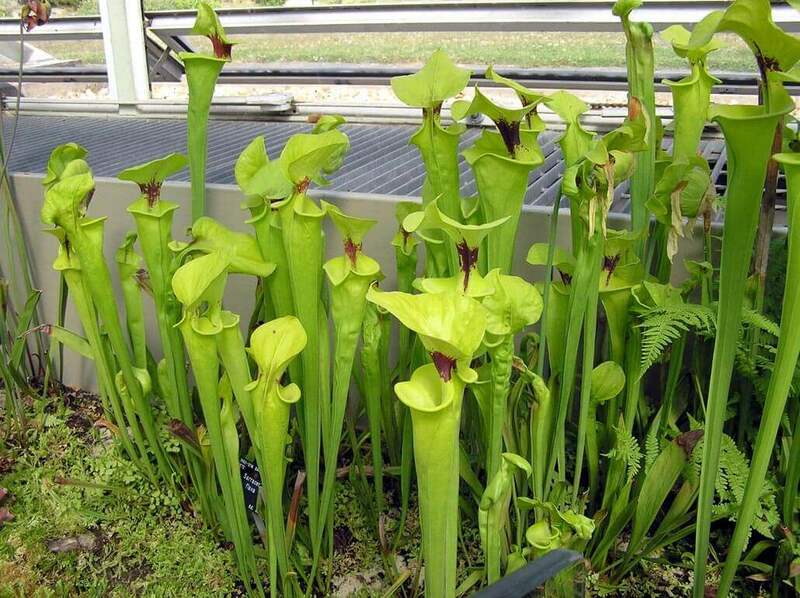 No fertiliser of any kind should be provided to your Pitcher Plants. They're experts at dealing with nutrient-poor situations and this is why they've evolved to capture insects. All the nutrients they'll need will come from their own ability to trap pray within the pitchers and you don't need to give them anything extra. If you never get any insets in your home (lucky you! ), then consider putting your plant outside for a few weeks or so during the Summer and they'll catch ample food during this time. They like it warm to hot when in active growth so a typical home is perfect, and in Winter they like it cold. Really cold. Unlike almost every other houseplants they'll happily take mild frosts when dormant. You seldom need to repot a Sarracenia into a bigger pot unless the container you're starting with is very small. As a base guide, consider potting on once every 2 to 3 years and this is primarily to refresh the growing medium to ensure it holds water correctly as well as removing any build up of minerals that have occurred over time. By this point in our article, you should know already that these plants are used to a lack of nutrients, and this extends to the type of growing medium they live in. You must not use any normal houseplant compost or, as someone once asked, "dirt from the yard". There are lots of different mixes you can use or create yourself, but if you're very new to these plants and don't want to spend a long time researching growing mediums, just pick up or order some compost that's labeled for carnivorous plants. You can propagate Pitcher Plants from seed, but this requires two different plants to start with and then a large amount of time (3 to 5 years) to grow the plant from seed to a large enough size to produce pitchers. Instead it's normally more efficient to use the rhizome, which is the most important part of a Pitcher plant and holds the key to successful easy propagation in most cases. All you need to do is split a mature rhizome in half (or even smaller if you want more than two plants). It's best to wait until early Spring when new growth is starting so it's easier to handle and gives you a good view of where all the bits and pieces are. Try to make sure each split of the rhizome has a few new leaves forming and some roots to give the plant the best chance of establishing. Pot up using carnivorous plant compost and treat like you would an adult plant. With warm temperatures, excellent light levels and ample water these plants grow really fast. Several new leaves / pitchers forming each week is not unheard of. There are many varieties and hybrids which all have different growing traits. In general, your plant will be classed as either a tall or short growing variety. Most shop or store brought Pitcher Plants will be the short fairly compact growing variety and they'll unlikely to reach more than 25cm / 10 inches. The tall varieties grow considerably higher, up to 100cm / 3.5 ft although they normally need full outdoor exposure and for that reason tend not to make good houseplants. Given a Winter Rest (see below) come Spring the plant will come back to life and shortly after "waking up", it will often produce some interesting complex looking flowers that rise high above the plant and last for a few weeks. These die down and are gradually replaced by the pitchers. On our own plants' flowers have also appeared in mid to late Summer if they've been treated well. They're sometimes scented although at times the smell can be unpleasant. If you find it too overpowering then you can simply cut the flower stem off. 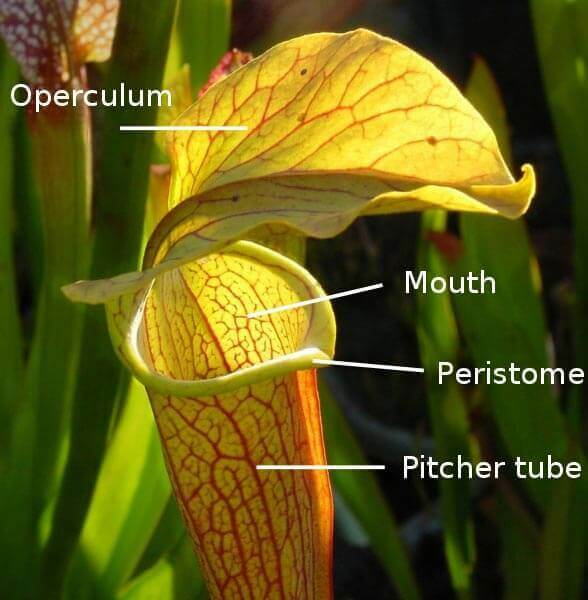 Is the Pitcher Plant Poisonous? 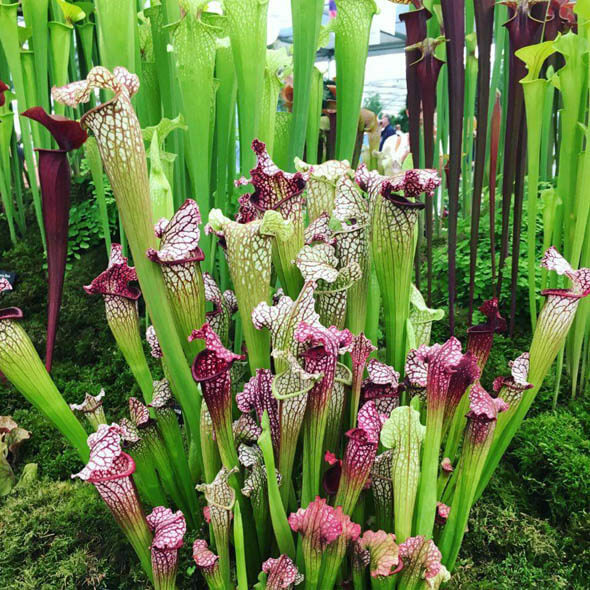 Pitcher Plants are non-toxic to cats, dogs and people. Towards the middle and end of autumn (October / November in the northern hemisphere) the light and temperature levels will fall, which should then trigger the dormancy process. You'll notice during this period that some of the growth will be dying off, turning black or just looking very tatty and this will continue for a month or so. Remove and discard the dead or tatty growth. - Pitcher Plant not showing dormancy signs? During this time, cut back on the watering and aim to keep the soil just damp rather than wet as you should have been doing during the Spring, Summer and early autumn. When growth has stopped and the existing leaves are looking tatty or have died completely (November / December) you should move your plant to a cool location for the Winter. An unheated greenhouse, porch or conservatory are all good places. Some people even put their plants outside in a sheltered place like a shed or cold frame, although you should still take care to protect the rhizome from extreme weather conditions and excessive rainfall. Remember to only keep the soil just damp during this period and ensure there is ventilation to reduce the chances of rot or fungus attacks. When the heat and light levels increase again, so very late Winter / Early Spring (February / March / April) new growth will start to appear. Cut off all the tatty growth from the previous year and slowly bring it back to where it was growing prior to the rest. New leaf shoots or pitchers should start to appear fairly quickly and within a few months, your plant will be its usual self complete with many new pitchers to admire as it uses them to lure prey into once more. The photo here shows our Pitcher Plant in Spring (end of March) after it's completed it's Winter rest period in an outdoor garden shed. We removed all the tatty and dead leaves and pitchers at the end of February leaving just a few inches at the base. Already you can see several new shoots growing. High Light Levels Direct sunlight for at least a few hours a day is needed. Heavy Watering Try to ensure the plant is sitting in water constantly. Warm Temperatures Normal to warm indoor room temperatures are required when it's growing. Feeding No fertiliser should be provided at any time - it creates its own by catching and digesting "prey"!. If the light levels are poor then this could be the result - Move to a sunnier spot. If you're noticing this towards the end of Summer then it's probably normal. The plant knows the Winter dormancy is coming so it conserves its energy by creating more simple leaves rather than the more complex pitchers. Give it the Winter rest and the pitchers will be back next Spring. This is caused by one of two things - firstly Sarracenia loves the sun, but if it's not used to intense sunlight then the leaves / pitchers may burn and crisp as you can see in the picture. The second and more likely cause is that you've allowed the soil to dry out too much during the growing season. 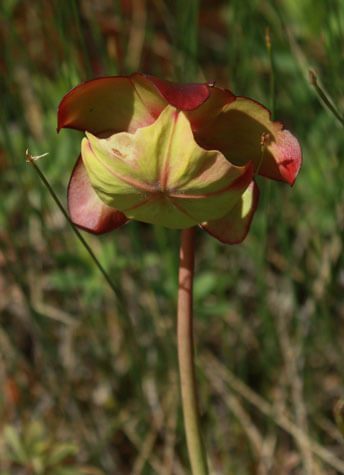 No Sarracenia species is forgiving of its watering requirements. You must supply a constant source of water around the roots during the growing months. In either case hopefully, you've spotted the damage and corrected the problem before it became too bad. 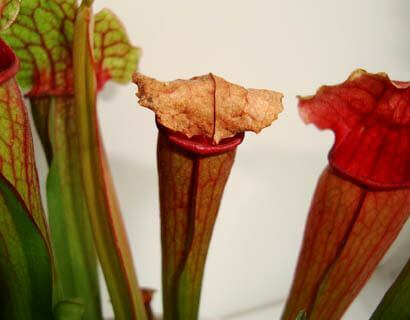 If it's very disfiguring you can cut the damaged pitchers away and new growth will eventually fill the space. You must provide high levels of sunlight to keep the markings. If the light level is too low, over time existing pitchers will develop a washed out appearance and new pitchers will either be completely green or only mildly marked. 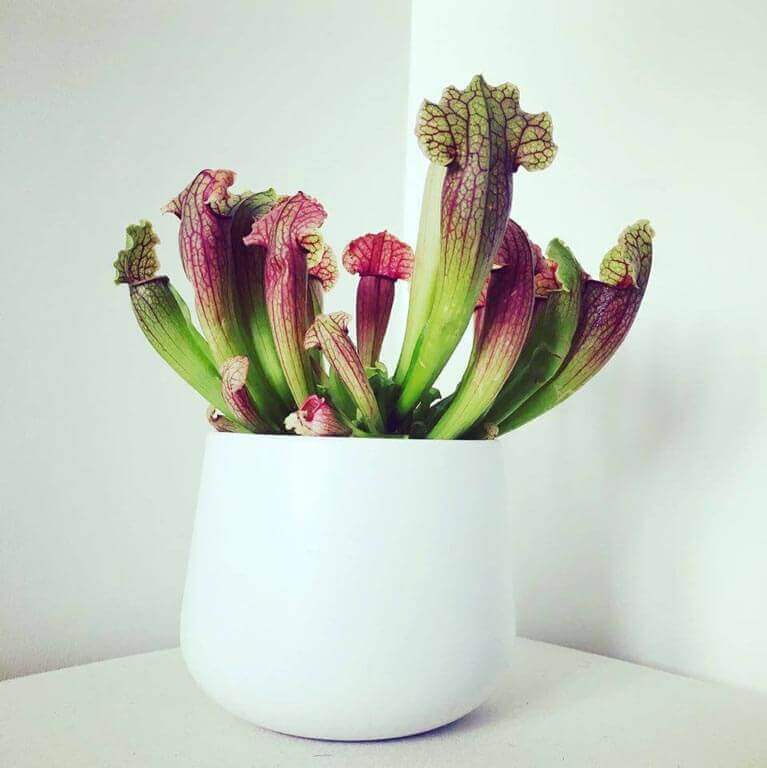 Should I feed my Pitcher Plant with dead insects? No. The plant is adapted to capturing live prey itself. And they can catch a lot over a growing season. If you feed the plant with dead insects then it could cause issues in the long term, for example, the insects might be dead because they were poisoned which you're now spreading into the plant. If you really do have an insect free home and no access to put your plant outdoors occasionally then a weak houseplant feed once or twice a year might be worth considering. It's not known for certain exactly what triggers Pitcher Plant dormancy, the general view is that it's the combination of lower light levels with falling temperatures. So in most cases, if your plant fails to stop growing as you approach Winter then it's likely because it's too warm in your home still. The dormancy is essential for the continuous long term health of your plant, so if it's not happening naturally move it to a cooler spot to force the process to start. Pitcher plants are quite hardy when it comes to pests and diseases, but they can be weakened and damaged overtime by pests which attack in mass. For that reason, Aphids can be a problem and if you notice them you should take action.